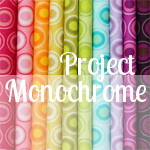 In Color Order: Project Monochrome: PINK! Project Monochrome is a challenge to work with a wide range of colors, focusing on one at a time. I'll be constructing a series of sewing and quilting projects to explore each color. Feel free to join me! More information here. Project Monochrome: Pink, a photo by jenib320 on Flickr. For my first project, I choose to use PINK! I love the look of flying geese, and after seeing Alexis's most recent quilt, I got stuck on the idea for this little quilt. I like pink quite a lot, so it was a little difficult to narrow down my fabric choices. Since I was using this flying geese ruler, which creates four geese units out of two squares of fabric, I had to settle on a background and 8 prints! I tried to choose an even mix of organic and geometric prints as well as light and dark pinks. I was originally going to pair the geese fabrics with a solid white for the background, but in the end decided against it. It kept feeling too nursery/baby, I think because of those really light pinks. I think the dark pink shot cotton helped ground it and gave it a little more interest. WIP, a photo by jenib320 on Flickr. The quilt is made up of eighteen 2"x4" (finished) geese units. This rounds it out right about 16" square. I choose a simple quilting design, stitching with light pink thread on either side of the horizontal and vertical seams. It's backed with pink Heath by Alexander Henry and bound in one of my favorite prints, Arvika by Alexander Henry. A little peek at my next project, using the color RED! Project Monochrome: Red, a photo by jenib320 on Flickr. Oh wow! I love the pinks!! :) Nice work on the monochromatic and all those points! Hugs! What a lovely little quilt and exciting project. Can't wait to see the rest. Oh fun! Cannot wait to see it tomorrow! Checked out the quilt expo today in Madison ... picked up a yard of fabric and a charm pack - all pink, LOL! Looking forward to getting together tomorrow! I'll be bringing you pink Pyrex in keeping with the pink theme for now! that design is really pretty as well, love your fabric choices! I really love pink and this works great without being at all banish, love it! Love your fabric choices! Well done! beautiful, it looks so perfectly done too! What a beautiful little quilt.I love your fabrics choice. i love it! I'm obsessed with geese right now too. I really need to get that AH heath in every color. I really like that idea, Jeni. Those fabrics are gorgeous! Oh, so pretty! I love the way the darker pink looks instead of white. It makes it so sophisticated. Stunning! This is adorable! And what a pretty array of prints. Looking forward to seeing the rest of your monochrome pieces! This project is fun to watch, Jeni. I love the pink Heath for the back. Such a great print! It's so pretty, Jeni! I'm catching on blog reading, so I just saw your post about your new Project Monochrome. Lovely start! Pretty! I love the pinks!